I almost missed this newest adaptation of a Jane Austen novel. 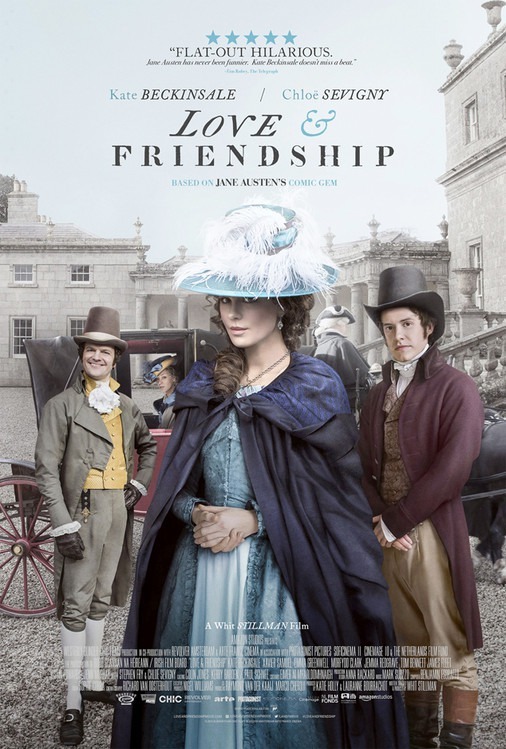 Based on Austen’s long unpublished Lady Susan, Love & Friendship stars Kate Beckinsale and Chloe Sevigny with Tom Bennett. This is the very first film based on Austen’s short 115 page novella, published over 50 years after Austen’s death. If you’re thinking Elizabeth Bennett, don’t, Lady Susan, the ultimate selfish schemer, is clearly not your grandmother’s romantic heroine. This epistolary novel, an early complete work that the author never submitted for publication, describes the schemes of the main character-the widowed Lady Susan-as she seeks a new husband for herself and one for her daughter. Although the theme, together with the focus on character study and moral issues, is close to Austen's published work (Sense and Sensibility was also originally written in the epistolary form), its outlook is very different, and the heroine has few parallels in 19th-century literature. Lady Susan is a selfish, unscrupulous and scheming woman, highly attractive to men, who tries to trap the best possible husband while maintaining a relationship with a married man. She subverts all the standards of the romantic novel: she has an active role, she is not only beautiful but intelligent and witty, and her suitors are significantly younger than she is (in contrast with Sense and Sensibility and Emma, which feature marriages by their female protagonists to men who are 16 years older). Although the ending includes a traditional reward for morality, Lady Susan herself is treated more leniently than the adulteress in Mansfield Park, who is severely punished. Love & Friendship opens May 13th in the US, the 26th of May in the UK.